Everything! The alpine deco is very sweet, the rooms are lovely, the 2 bathrooms which made it very practical for everyone to get ready. There is also a lot of staple groceries provided which is really handy (ketchup, oil, salt and pepper, biscuits ...) which you don’t always have in self-catered locations. The coded boxes for the entrance door and the ski locker were also very practical when we all left at different times. The host was on hand to answer all our questions. Location was great for skiing, a 2mn walk to the lift. There was also a mini supermarket very near and a ski hire shop by the complex. Perfect! Very cosy well equipped apartment. Nice colours used and tiny kitchen is really well equipped. Lots of mugs, plates, glasses and cutlery and small but efficient dish washer. Hosts provide tea, coffee, chocolate and herbs and spices and it's great to have loads of dishwasher tablets and enough loo roll for six people for a week! The keys are in a key safe outside the apartment so no need to queue up to check in. Our beds were made and towels supplied. It's lovely that on the balcony are well stocked bird feeders so if you are there daytime and sit still you get feathered visitors close up. Lots of lovely hot water for the bath and shower. They provide handsoap and shower gel and shampoo if you don't take your own. 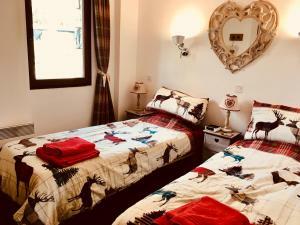 well managed excellent facilities, lots of little extras included Tv, coffee tea , shower gel etc. Great location for Daille lift, bus stop, underground parking and spar supermarket. The apartment was perfect for our family’s ski holiday. The hosts left lots of lovely touches that were welcome surprises for our arrival. The location was very handy for skiing as well as accessing other areas by the free frequent shuttle bus. Brilliantly equipped, warm and cosy. Set up really well for a group of friends or a family like us. Bus to lift right outside. By arrival we felt very welcome and safe in the different introductions and settings in the appartment. The appartment was really clean and some Nice essentials was already bought for us (coffee, toiletpaper...). 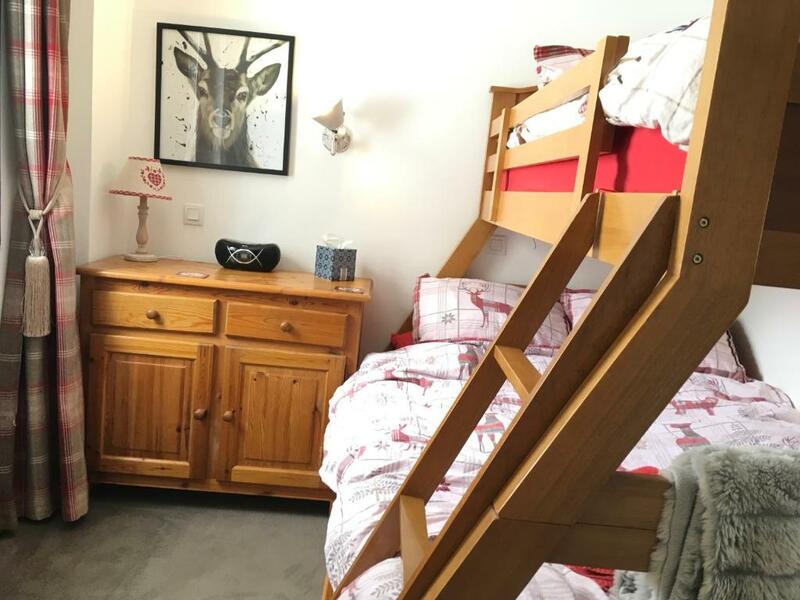 Noua avons aimé l'agencement et la décoration de l'appartement , loin des aménagements impersonnels ou stéréotypés . L'impression dégagée est celle d'une atmosphère chaleureuse et attentionnée . 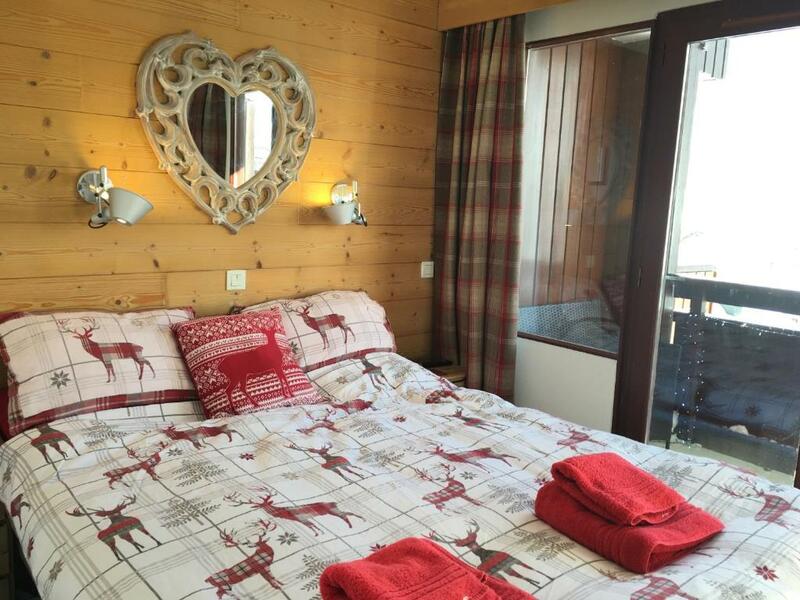 Lock in a great price for Les Balcons de Bellevarde – rated 9.3 by recent guests! Les Balcons de Bellevarde is located in Val d’Isère in the Rhône-Alps Region. Free WiFi is provided throughout the property. Featuring a balcony, the accommodations has 2 bedrooms, 2 bathrooms a, an open plan kitchen/living room area with additional sofa beds. A flat-screen TV and Blu-ray player are provided. 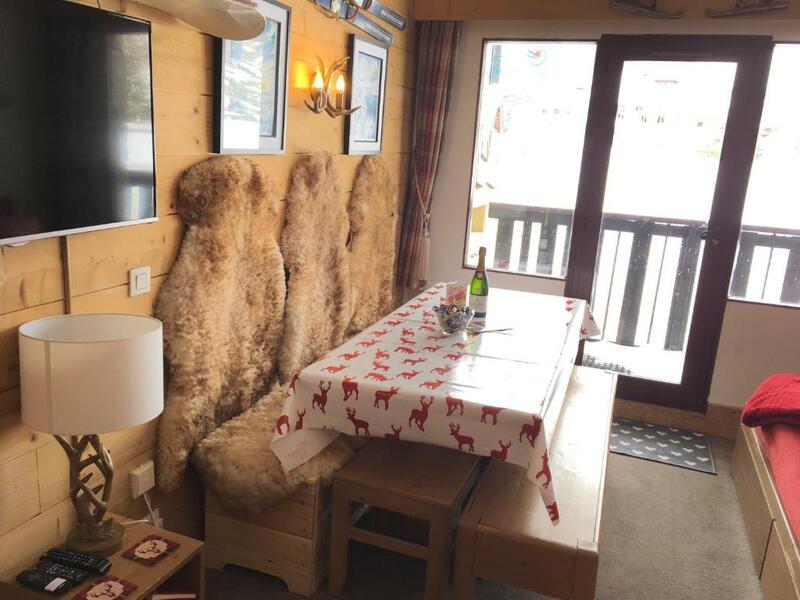 The property has ski storage space and ski equipment hire is available. Guests will find restaurants, supermarket, ski school & elevator pass office in front of the apartment. Funival Ski Elevator is 1,000 feet from Les Balcons de Bellevarde. Chambéry-Savoie Airport is 54 mi from the property. 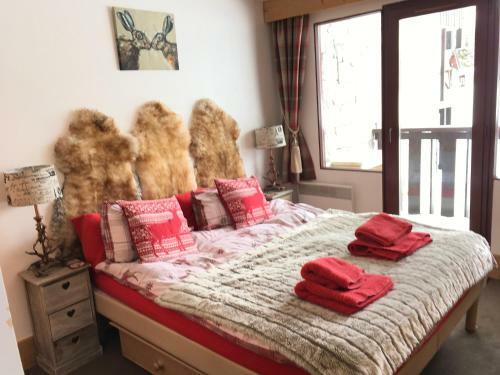 This property also has one of the top-rated locations in Val-d'Isère! Guests are happier about it compared to other properties in the area. This property is also rated for the best value in Val-d'Isère! Guests are getting more for their money when compared to other properties in this city. When would you like to stay at Les Balcons de Bellevarde? The apartment has 2 bedrooms, 2 bathrooms a, an open plan kitchen/Living room area with additional sofa beds. The balcony offers views of the mountains. Public parking is available on site (reservation is needed) and costs EUR 15 per day. Fabulous apartment on 6th floor but accessible by lifts. Good size of 50m2 - larger than the other apartments in the building. Great views from balcony across to slopes. Open plan living/dining area. Functional kitchen with dishwasher, hob, microwave & fridge freezer. Master bedroom with double bed. Bedroom 2 with 2 single beds. Living room with 3 sofa beds so apartment sleeps 7 Bathroom with sink & bath with shower over. Shower room with sink, shower & w.c. Cloakroom with sink & toilet. Electric heating & plentiful hot water. Free wifi. Own ski locker. We have decorated the apartment as our home so there are lots of quirky touches like the artwork & old skis & skates. We have tried to provide all the little extras that you need for true luxury. The bedding is all 100% cotton with duck feather pillows & duvets. Although there are also a few anti allergy sets in the cupboards should you need them. In the bathrooms there are big fluffy towels & warming towel rails. Also some complementary toiletries. Hairdryer, iron & board are provided. There are Tv's in the living room & master bedroom. Also a blueray dvd player with dvds. 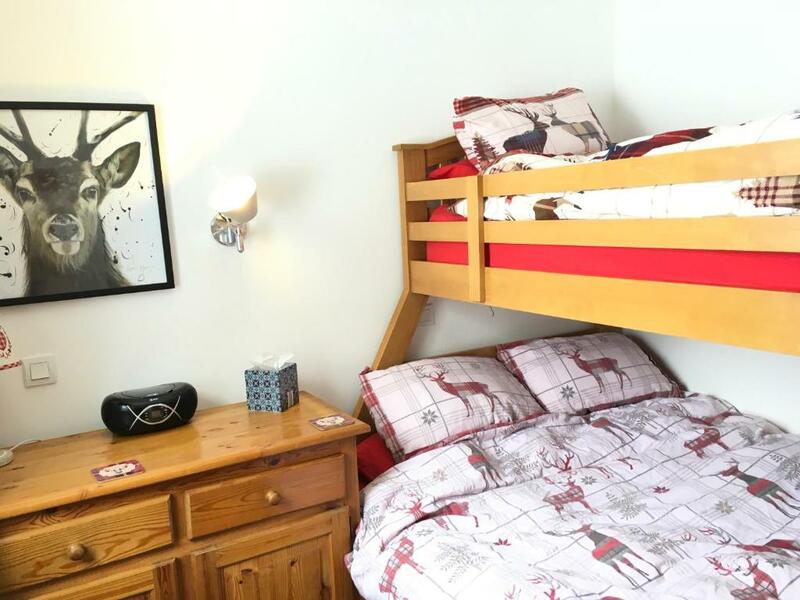 This is a personalised family apartment with lots of extras that make your stay great. Guest access: The apartment is in the Pierre & Vacances building. This apartment has its own ski locker on the ground floor. There are 2 local car parks (both charge) 1 covered under the building & 1 open air. ski rental shop attached. Interaction with guests: We may not be in Val D'Isere when you stay but are always contactable by phone or email. The neighbourhood: Surrounding the apartments are a number of bars & restaurants & a supermarket. We think this is one of the greatest ski areas in the world. Directly opposite the apartment is a ski pass office & next to it are 3 routes up the mountain with the funicular, bubble car & chair lift. These give amazing skiing to the Val D'Isere & Tignes joint area. In the summer the area is truly beautiful. Lots of wildlife can be spotted on the slope directly behind the apartment such as golden eagles, Marmots and Chamois. There is a free tennis court & boules area for use by residents. Mountain biking in Val d'Isere & neighbouring Tignes is FREE! You'll get access to around 150km of trails across the two biking areas. Summer skiing. House Rules Les Balcons de Bellevarde takes special requests – add in the next step! A EUR495 damage deposit is required 14 days before arrival (about USD551.63). This deposit will be fully refunded 7 days after check-out, as long as there isn't any damage to the property. Please inform Les Balcons de Bellevarde of your expected arrival time in advance. You can use the Special Requests box when booking, or contact the property directly using the contact details in your confirmation. A damage deposit of EUR 495 is required. The host charges this 14 days before arrival. That's about 551.63USD. This will be collected by bank transfer. You should be reimbursed within 7 days of check-out. Your deposit will be refunded in full by bank transfer, subject to an inspection of the property. 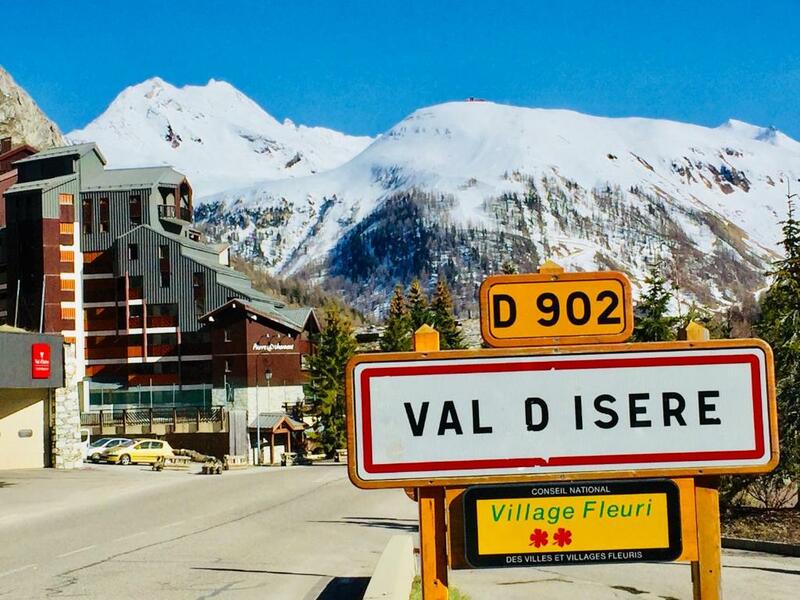 It is a little far from the centre of Val d’Isere to just pop in but there are very regular buses and it is only a 10mn walk to go there. Main reasons we only went a couple of times were because we were exhausted after a full day of skiing and the apartment was too cosy to go outside after a day out! The only niggle was I found the pillows a bit uncomfortable and only one of our party found the bed ok for comfort. The sofa beds are not comfy but then you don't expect too much from those. 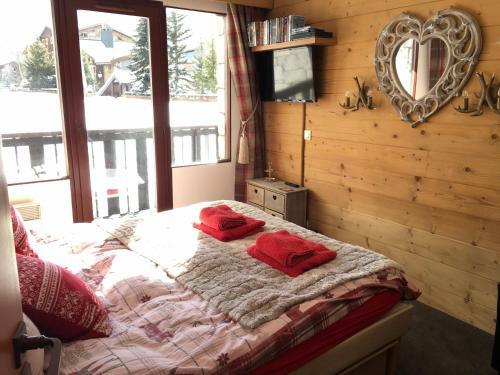 If you want compact ski accommodation it's fine. We wouldn’t change a thing about the apartment, it was wonderful. Before going I wondered if having a washing machine would have been useful but actually we didn’t require it. We tried to go to the pizza restaurant outside the building twice but both nights it was shut. A bit small, would be a tight fit for more than 5 people. The beds/ mattresses are very very firm.